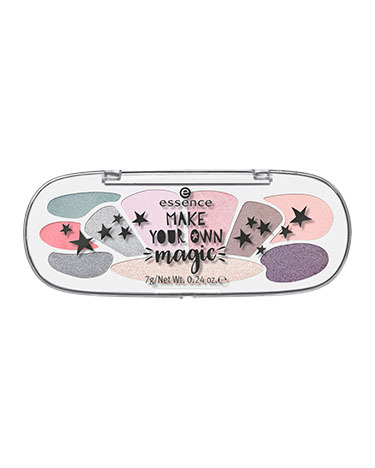 make your own magic eyeshadow box has a rating of 5.0 stars based on 1 reviews. Each of the extraordinary palettes not only offers a selection of highly pigmented shades, but also lets your eye make-up tell its very own story. All palettes contain ten highly pigmented, long-lasting eyeshadows with matt and pearly effects. "INGREDIENTS: TALC, MICA, TRIETHYLHEXANOIN, SYNTHETIC FLUORPHLOGOPITE, ZEA MAYS (CORN) STARCH, POLYGLYCERYL-2 TRIISOSTEARATE, C20-24 ALKYL DIMETHICONE, TAPIOCA STARCH, SILICA, PHENYL TRIMETHICONE, ZINC STEARATE, MAGNESIUM MYRISTATE, ETHYLHEXYLGLYCERIN, ISODODECANE, AQUA (WATER), POLYMETHYLSILSESQUIOXANE, STEARIC ACID, PALMITIC ACID, LAURIC ACID, DEHYDROACETIC ACID, CI 77492, CI 77499 (IRON OXIDES), CI 77510 (FERRIC AMMONIUM FERROCYANIDE), CI 77891 (TITANIUM DIOXIDE). AND/UND INGREDIENTS: TALC, MICA, TRIETHYLHEXANOIN, SYNTHETIC FLUORPHLOGOPITE, ZEA MAYS (CORN) STARCH, SILICA, TAPIOCA STARCH, POLYGLYCERYL-2 TRIISOSTEARATE, C20-24 ALKYL DIMETHICONE, PHENYL TRIMETHICONE, ZINC STEARATE, MAGNESIUM MYRISTATE, ETHYLHEXYLGLYCERIN, ISODODECANE, AQUA (WATER), MALTODEXTRIN, POLYMETHYLSILSESQUIOXANE, STEARIC ACID, PALMITIC ACID, LAURIC ACID, DEHYDROACETIC ACID, MAY CONTAIN/[+/-]: CI 19140 (YELLOW 5 LAKE), CI 75470 (CARMINE), CI 77007 (ULTRAMARINES), CI 77491, CI 77492, CI 77499 (IRON OXIDES), CI 77891 (TITANIUM DIOXIDE). AND/UND INGREDIENTS: MICA, TRIETHYLHEXANOIN, TALC, SILICA, SYNTHETIC FLUORPHLOGOPITE, ZEA MAYS (CORN) STARCH, POLYGLYCERYL-2 TRIISOSTEARATE, C20-24 ALKYL DIMETHICONE, TAPIOCA STARCH, PHENYL TRIMETHICONE, ZINC STEARATE, MAGNESIUM MYRISTATE, ETHYLHEXYLGLYCERIN, ISODODECANE, AQUA (WATER), TIN OXIDE, POLYMETHYLSILSESQUIOXANE, STEARIC ACID, PALMITIC ACID, LAURIC ACID, DEHYDROACETIC ACID, CI 77492, CI 77499 (IRON OXIDES), CI 77891 (TITANIUM DIOXIDE). AND/UND INGREDIENTS: TALC, MICA, SILICA, TRIETHYLHEXANOIN, POLYGLYCERYL-2 TRIISOSTEARATE, C20-24 ALKYL DIMETHICONE, ETHYLHEXYLGLYCERIN, ZEA MAYS (CORN) STARCH, ZINC STEARATE, MAGNESIUM MYRISTATE, PHENYL TRIMETHICONE, ISODODECANE, SYNTHETIC FLUORPHLOGOPITE, TAPIOCA STARCH, TIN OXIDE, AQUA (WATER), POLYMETHYLSILSESQUIOXANE, STEARIC ACID, PALMITIC ACID, LAURIC ACID, DEHYDROACETIC ACID, MAY CONTAIN/[+/-]: CI 19140 (YELLOW 5 LAKE), CI 77491, CI 77499 (IRON OXIDES), CI 77891 (TITANIUM DIOXIDE). AND/UND INGREDIENTS: MICA, TALC, SILICA, TRIETHYLHEXANOIN, SYNTHETIC FLUORPHLOGOPITE, ZEA MAYS (CORN) STARCH, POLYGLYCERYL-2 TRIISOSTEARATE, C20-24 ALKYL DIMETHICONE, TAPIOCA STARCH, PHENYL TRIMETHICONE, ZINC STEARATE, MAGNESIUM MYRISTATE, ETHYLHEXYLGLYCERIN, ISODODECANE, AQUA (WATER), POLYMETHYLSILSESQUIOXANE, TIN OXIDE, MALTODEXTRIN, STEARIC ACID, PALMITIC ACID, LAURIC ACID, DEHYDROACETIC ACID, CI 75470 (CARMINE), CI 77007 (ULTRAMARINES), CI 77491, CI 77492, CI 77499 (IRON OXIDES), CI 77891 (TITANIUM DIOXIDE). AND/UND INGREDIENTS: TALC, MICA, TRIETHYLHEXANOIN, SYNTHETIC FLUORPHLOGOPITE, ZEA MAYS (CORN) STARCH, SILICA, TAPIOCA STARCH, POLYGLYCERYL-2 TRIISOSTEARATE, C20-24 ALKYL DIMETHICONE, PHENYL TRIMETHICONE, ZINC STEARATE, MAGNESIUM MYRISTATE, ETHYLHEXYLGLYCERIN, ISODODECANE, AQUA (WATER), POLYMETHYLSILSESQUIOXANE, STEARIC ACID, PALMITIC ACID, LAURIC ACID, DEHYDROACETIC ACID, CI 77491, CI 77499 (IRON OXIDES), CI 77742 (MANGANESE VIOLET), CI 77891 (TITANIUM DIOXIDE). AND/UND INGREDIENTS: TALC, SILICA, TRIETHYLHEXANOIN, POLYGLYCERYL-2 TRIISOSTEARATE, C20-24 ALKYL DIMETHICONE, ETHYLHEXYLGLYCERIN, ZEA MAYS (CORN) STARCH, ZINC STEARATE, MAGNESIUM MYRISTATE, PHENYL TRIMETHICONE, ISODODECANE, SYNTHETIC FLUORPHLOGOPITE, TAPIOCA STARCH, TIN OXIDE, MALTODEXTRIN, AQUA (WATER), POLYMETHYLSILSESQUIOXANE, STEARIC ACID, PALMITIC ACID, LAURIC ACID, DEHYDROACETIC ACID, CI 75470 (CARMINE), CI 77499 (IRON OXIDES), CI 77891 (TITANIUM DIOXIDE)."